The town is most famous as the site of the siege and subsequent surrender of General Cornwallis to General George Washington during the American Revolutionary War on October 19, 1781. Although the war would last for another year, this British defeat at Yorktown effectively ended the war. Yorktown also figured prominently in the American Civil War (1861–1865), serving as a major port to supply both northern and southern towns, depending upon who held Yorktown at the time. Today, Yorktown is part of an important national resource known as the Historic Triangle of Yorktown, Jamestown and Williamsburg, and is the eastern end of the Colonial Parkway. Immerse yourself in 300 years of history and enjoy lodging in a hotel or bed and breakfast nestled among the village streets and paths or overlooking the York River. 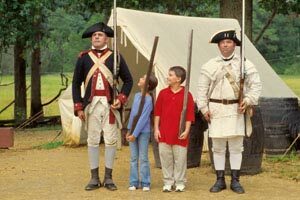 Here you can experience 18th Century homes and revolutionary battlefields. Picturesque streets are the backdrop for art galleries, antique and specialty shops.